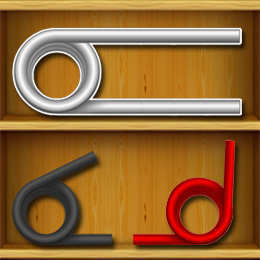 Standard springs are also known as stock springs. These springs are kept in inventory so that customers may buy springs off the shelf and avoid long lead times. What makes them standard is that their spring dimensions are made from the most common (standard) fractional sizes like 3/32, 3/16,1/4, 3/8,1/2 and many others. Standard springs are provided to you by Acxess Spring through The Spring Store and come in many variations. The types of standard springs are standard compression springs, standard extension springs, standard torsion springs, and standard conical springs. Standard compression springs are helically wound wires one on top of the other with pitch in between and form the shape of a cylinder. You may search for these standard springs through The Spring Store by using our online standard compression spring finder. Once you are there, you may input your spring's free length and outer diameter (or inner diameter) to make a quick and basic search of your standard springs. When you do this search, you will be provided with a table of designs which are closest to the compression spring dimensions you specified. This table provides you with more thorough information like your spring's rate, maximum safe load, maximum safe travel, etc. Shop for standard compression springs now at The Spring Store by Acxess Spring! Standard extension springs are round wires helically wound tightly one on top of the other in the shape of a cylinder with hooks on the ends. 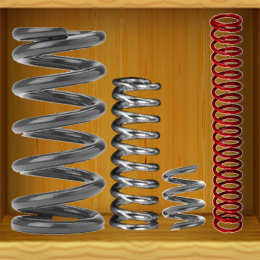 The Spring Store allows you to search through our wide variation of standard extension springs using our online standard extension spring finder. To make a basic search for these springs, you will only need to know your extension spring's outer diameter and length inside hooks. You will then be directed to a table of the standard extension spring results your search generated. These tables show your spring's full physical extension spring dimensions along with technical information such as rate and maximum load. Buy standard extension springs quick and easy at The Spring Store by Acxess Spring! Standard torsion springs are made when a round wire is helically wound tightly to form spirals. The spirals on standard torsion springs are usually wound tightly one on top of the other and the ends are left straight to make your standard torsion spring's legs. 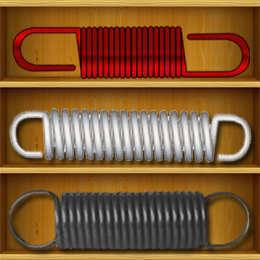 These standard springs are provided to you by The Spring Store where we give you the opportunity to search standard torsion springs through our online standard torsion spring finder by entering only two torsion spring dimensions which are outer diameter (or inner diameter) and total coils (or active coils). After clicking on "Search", a chart will be provided to you with your torsion spring search results. These results will give you all the information you need to determine wether this spring will work for you or not. Get your standard torsion springs off the shelf at The Spring Store by Acxess Spring! Standard conical springs (or tapered springs) are cone shaped compression springs. These standard springs are made when wire is wound in a circular motion forming spirals of different size diameters to make a tapered shape. 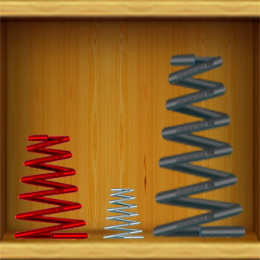 You can find standard conical springs fast at The Spring Store. The only conical spring dimensions that you'll have to input into our online standard conical spring finder are your standard conical spring's large outer diameter (or small outer diameter) and free length. You will then be directed to a chart where you will be provided with your conical spring search results. These results will specify all dimensions needed such as maximum safe travel and an approximate rate. Get your standard springs fast at The Spring Store by Acxess Spring!